Childrey Classic in the Gales! The Peaky Climbers managed to stay as part of the lead elite group for the first 25 miles, averaging just over 20mph but as we approached the first climb at Compton Beauchamp it became apparent that we were not all going to be staying with these riders for the whole route. At this point with Allen needing to answer a call of nature (shock!) 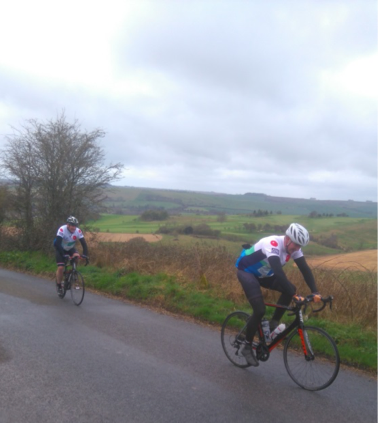 and Simon and Ben attacking the hill at a more leisurely pace the team split into two, with hill specialists Nobby & Mark (Hinge & Bracket) powering on with Grench’s very own Adam Stay in hot pursuit. Once Allen, Ben & Simon had finished the required stops and refuelling they headed off towards Ashbury and the start of the long route section which included all the course climbs. The wind had now picked up and the first sign of real rain was showing, so it was heads down, literally to minimise wind resistance, and ride on. The next slope of note was Fox Hill and then onto Draycot Foliat, Ogbourne St George where often exposed to harsh weather conditions, these were tough sections which normally in the summer (with no wind) are very pleasant on the eye. Having cycled through the picturesque village of Ogbourne St George, the next challenge was going to be its infamous hill, which at 17% is unforgiving, Allen asked Simon and Ben to take this one slowly, so that he could get ahead and take some pictures at the top and earlier a highlight for Cricky was whilst climbing strongly on his new steed ‘Caroline’ he passed an elite team rider. We were joined at the top of the hill by another fellow Grench cyclist, Kevin Sanders, who then joined us for the remainder of the ride. Having got the hardest hill out of the way it was then just a case of heading towards the top of Lambourn via Albourne, which has a sneaky short but sharp hill to be climbed on the way to Baydon. Time ticked on and as we continued to cycle we wondered if we were going to find a spent Mark, Nobby or Adam by the side of the road, but obviously they were staying super fit and ahead of us now by over 20 minutes. By this section of the ride, you don’t tend to see many of the other competitors as everyone is spread out riding in their own little groups, but we did pick up and pass the occasional straggles that had overdone the first part and were now paying the price, but not Nobby & Cricky who had sprinted home in very impressive non-stop times of 3 hours 35 mins & 3 hours 42 mins. Having been wind assisted Allen’s trio came to the very long ride out of Lambourn and up the valley to Ashbury, again in the summer this is a lovely route, especially if coming down the hill. Although the climb never gets steep it is continuous and we were back to cycling in to a strong head –wind. From Ashbury it’s then following the familiar spring line road past Uffington, with a quick diversion up the infamous White Horse Hill and another photo opportunity, and on to Westcott. 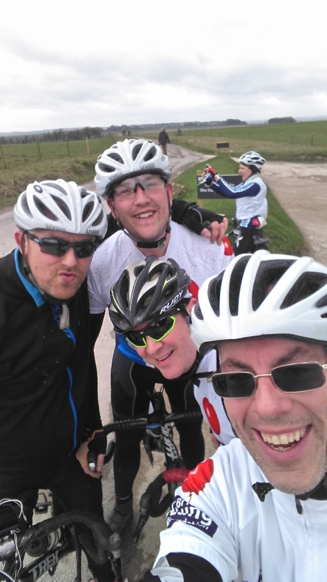 Then it’s just the short blast back to Childrey, where everyone seemed to be buoyed by the idea of the waiting bacon baps and picked up the pace a bit and as we approached the finish line the 4 of us formed a sky team style line to ride in together. Then it was in to the pavilion for our long awaited and well deserved reward of food and catching up with friends and fellow riders to see how their day went.Another great ride in the bag.